It's cherry season! I bought several pounds of cherries at the farmer's market and realized that we wouldn't be able to eat them all, so I started looking for recipes to can some or make pie filling. While browsing Pinterest I stumbled on this 'boozy cherry' recipe and decided to try making some cocktail cherries in syrup to give out as Christmas gifts this year - after all, it's never too early to start thinking about Christmas right? And handmade is always the way to go. I did make a few minor alterations to the original recipe (since I didn't have any vanilla vodka, I used vanilla beans and regular vodka instead). But for the most part I used the recipe from The Saucy Trollop. With a name like that, she's got to be good! Even if you're a beginning canner, you can master this recipe. It's really easy to follow. Bring a water bath in your stock pot to a boil. Prep your jars, rings and lids and keep warm. Meanwhile bring the 2 cups water and sugar to a boil in a small saucepan, whisking to dissolve the sugar. Remove from heat and set your simple syrup aside. 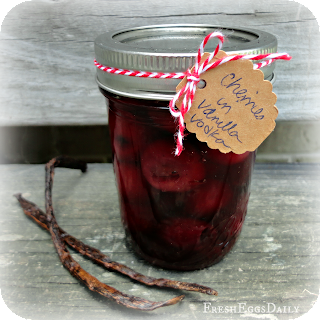 Remove the canning jars from the water bath and fill with the cherries and two halves of vanilla bean in each jar, filling the jars about 3/4 full and pressing down a bit to compress the contents. Divide the simple syrup between the jars, filling each about 1/3 of the way full, then fill to the top with vodka, leaving 1/4" headroom in each jar. Place a lid and ring on each jar and finger tighten. Then place in the boiling water bath on a rack (make sure the jars are covered by at least an inch of water) and process for 9 minutes.Once the nine minutes are over, turn off the heat and let the jars sit in the water for five more minutes. Remove the jars from the water bath, set them on a dish towel to cool on the counter to room temperature. After they are cooled check to see that the lids are sealed. Dry the rings and screw them back on. Label the jars and store in a cool dark place for up to a year. Pitting the cherries is the part that takes the longest time! Get your rings and lids ready! Add your simple syrup and vodka, process and cool. I love hearing those lids seal! The cherries and syrup can be poured over ice cream, added to ginger ale, club soda or seltzer for a yummy adult Shirley Temple cocktail or eaten straight up. Remove the vanilla bean and discard when you open each jar for use. Adult Shirley Temples are never wrong. Oh do! I can't wait to try them this winter! Looks Yummy. I would love if you would link this up on our blog @ http://thekoenigscreate.blogspot.com/2013/08/mid-week-link-up.html We have a link party going on now till Friday. Also newest follower via GFC and Bloglovin. Thanks Angel! 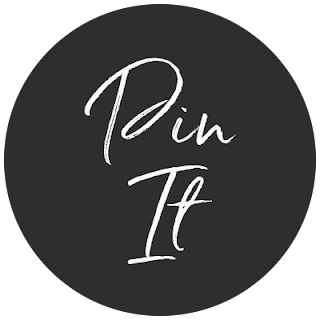 I love your party...and don't you just love Bloglovin? These look absolutely delicious and will make wonderful gifts....very pretty to look at too! I think I just discovered what I'm making everyone for Christmas gifts this year. Great post. Thanks for sharing on Wildcrafting Wednesdays! I hope you'll join us again and share more of your awesome posts in the future.